“Playing dress up begins at age 5 and never truly ends…Kate Spade”. That’s Seniorita Magda! She’s here to show you that you are never too old! 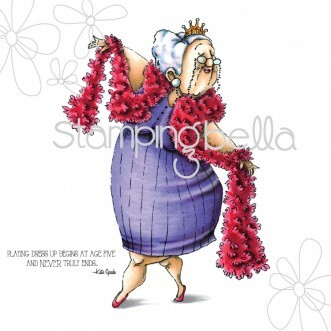 Needing another yet another birthday card, I choose this image from Stamping Bella. Once again, I used my Copics to color her. I added some Glossy Accents to her crown and glasses. Each one of these “Seniorita’s” have their own personality! Since there is no matching die for this image, and I didn’t want to “fussy” cut this one out, I used a die from Lawn Fawn, the Large Stitched Ovals. I used some striped twine that I had in my stash to put a border around the image. I added a few enamel dots but wanted to keep the rest of the card pretty simple.